Never before had Brady endured such satifaction and pain all at once. 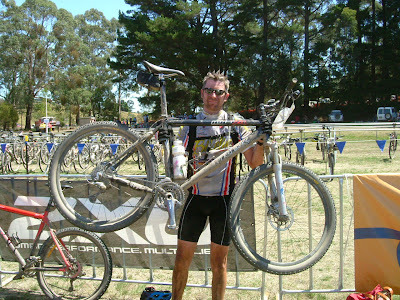 This race was huge, 105km of the most rugged terrain known to any Mountain Biker. Over 700 competitors took part in the innugral Race. It starts in the tiny Great Ocean Road township of Apollo Bay, Victoria and winds its way through the Otway Ranges inland to Forrest. The fatalies were huge, 250+ riders pulled out, it was tough. The winner Murray Spink said in his post race interview that he had never ridden a course like that ANYWHERE in the world. After 7 hours and 29 minutes Brady emerged from the jungle covered in blood, mud (and maybe a few tears) to finish in an incrediable place of 129th overall. Quite an awesome feat as he hadn't ridden his mountain bike for about 4 months and this was only his 6th time on the bike (and this was his 2nd marathon)!! CRAZY MAN.